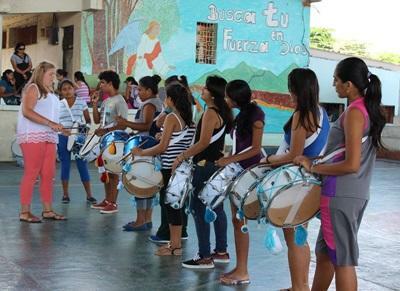 The Creative Arts project in Ecuador is based in the town of Puerto Baquerizo Moreno on San Cristobal Island. The project is dedicated to helping young people in the area practise their talents and become more aware of the opportunities in the field of creative arts. Artistic expression is a universal language with dance and drama being just two variations. In the case of children, dance, drama and music can be used as a means of communicating their challenges as well as helping their personal development. Volunteers will get the opportunity to work students aged 12 and older in schools and at the local art and culture centre. The main aims of these artistic extra-curricular activities are to encourage personal development, support young people through difficulties, nurture artistic skills as well as preparing for various dance, drama and musical shows. Depending on where your talents and interests lie, as a volunteer you can get involved and focus on one or all of the below areas. Art – teaching the children and teenagers art including painting, drawing and working with recycled materials. Large murals – painting educational murals in classrooms in the schools and on outside walls of the town. Dance – teaching the children and teenagers in the local community different dance techniques. Music – teaching children and teenagers how to play different musical instruments, from the guitar to the piano, as well as singing lessons. Acting – developing the acting abilities of the local community, this is a fantastic way to encourage them to speak English through role playing. You may also help to write scripts and direct short plays and sketches. Depending on what areas you choose to get involved in, you will have the opportunity to prepare the children and teenagers to perform and showcase their talents in front of the community. Volunteers don’t need any specific qualifications to take part, but should be skilled in the areas they wish to teach. You will be responsible for running the activities, with assistance of the staff. It is also important that as a volunteer, you are enthusiastic, flexible, open to learning and keen to work with children and young adults. Anyone who has good organisational skills and experience of managing group dynamics will be well suited to the project. A basic knowledge of Spanish will be helpful if you decide to get involved in the music lessons and drama lessons, however it is not essential. You will find that as long as you are enthusiastic and use your initiative you will be able to communicate with the children and local staff. You will be expected to use your own initiative to lead the children in activities, but there will be support from the teachers in certain learning areas. The skills and experiences that will be shared will have a lifelong impact on the children in the community. The Creative Arts project is very flexible and also provides an invaluable forum for the development of artistic expression – an interest of many children that is often underrated. During the holiday time we also run a summer camp, so that the teenagers can still come to the centre to develop their art skills and study English. This camp takes place around March/April each year. You can join the Creative Arts project in Ecuador for two or three weeks if you don't have time to join us for four weeks or more. This project has been selected by our local colleagues as being suitable for short term volunteering for both the host community and the volunteer. Although you will gain a valuable cultural insight and work intensely within the local community please be aware that you may not be able to make the same impact as someone volunteering for a longer period.